Jillian Welk is the owner of Cabin + Cove, based in Waterloo, Ontario, Canada. Since 2010, Jillian's knits and patterns have been enjoyed by people worldwide, and she has taught hundreds of people of all ages the foundations of this craft. Jillian's work brings a modern appeal to the age-old knitting scene. 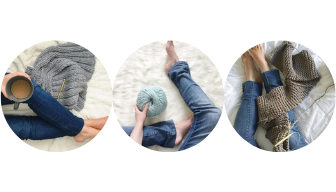 Cabin + Cove offers a collection of knitting patterns that inspires a new breed of knitters looking for on-trend, practical designs. Each pattern is written with the beginner knitter in mind, offering clear instructions and spectacular photography. Every year, a collection of Cabin + Cove knitwear is available made-to-order here in the shop and ready-made at select shows and stores. Jillian is proud to share her love of knitting with others through knitting workshops with the commitment of giving people of all ages a positive first experience to this craft. Her workshops are offered in beautiful, modern spaces that inspire creativity. 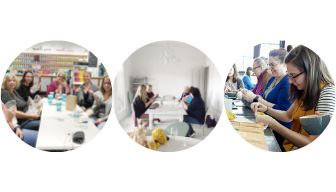 Jillian also hosts monthly Sip n' Stitch socials in Kitchener-Waterloo which offer the opportunity for knitters and crocheters of any skill level to come together to meet, mingle and make. Cabin + Cove is also home of The CozyRiot Project - a series of projects where knitters and crocheters create and spread the feeling of cozy and warmth to those in need. Living in the vibrant Waterloo Region, Jillian spends her days with her two adventurous sons and supportive, loving husband.